Thanks to Ula, this series isn’t suffering from the series plague anymore! Simon is dealing with being a vampire, his mother hating him for it an banishing him while random vampires court to him to join them and he is under constant attack. He has to move in with Kyle, a new band member, who turns out is Maia’s ex-boyfriend. Simon, who’s currently dating both Maia and Izzy, has a trouble juggling it all while also being trailed by a 14-year-old Maureen whom he bites after a gig due to hunger. Meanwhile Jace and Clary have some serious relationship issues because Jace keeps dreaming about killing Clary. After she is wounded and they sort of reconcile, he admits to her about the nightmares. They agree to seek help with Silent Brothers and Jace decides to stay with them until the protective ritual for him is performed. While in the City of Bones, he gets visited by Lilith in his dreams. She is disguised as Max, who convinces Jace to cut himself and draw a rune with his blood on his chest. The rune binds Jace to Lilith and she possesses him. Jace then kidnaps Clary and brings her to Lilith who already has Simon as well, who was brought to her by Maureen, now a vampire. She wants Simon to resurrect Jonathan (Sebastian) and she forces his hand with commanding Jace to kill Clary iff Simone refuses. Clary tricks Jace, breaks the rune and its spell and Simon kills Lilith after she tortures Clary. In the end, when Jace is alone and healing, he is possessed by Jonathan and has to revive him. Jonathan comes back among the living. The book starts with Simon’s difficult transition into becoming a Jewish vampire. Simon receives an offer from a vampire named Camille Belcourt – he says that if Simon joins her side as the Daylighter, he will earn his place in vampire society. Simon is worried about his mother – she has been suspicious ever since he went to Idris and did not return for a few days. Although Magnus erased memories of his absence, she has been suspicious of everything. Simon is attacked many times and each time his Mark of Cain curse works and the attackers are killed or flee. Anyone who tries to harm him quickly meets the biblical “sevenfold” death. Soon his mother confronts him about the blood he had stored in his closet and he’s forced to tell her what he is. She believes that he is no longer her son and begins to pray. With his power of persuasion he tells her it’s all a bad dream and she believes him. Knowing he can’t go back to his mother’s house, he moves in with his band’s new member, Kyle, who turns out is a werewolf, which Jace realized when he visited Simon. Meanwhile, Jace has been having dreams in which he murders Clary which led to him avoiding her and the couple having troubles. Clary and her mother discover that someone is trying to make more children like Jonathan. At Simon’s gig Clary and Jace work out a few issues while Simon runs off stage ill due to his lack of blood consumption. Maureen, a 14-year-old band’s only fan, follows Simon and asks for his picture. Halfway through taking it, Simon bites her and drinks her blood, but is interrupted by Kyle. After the incident with Maureen, Simon is confronted by Maia and Isabelle. They are furious at him, as he never told either of them that he was dating both of them. Halfway through the argument, Kyle shows up and Maia recognizes him. It turns out that Kyle is Jordan Kyle, Maia’s ex-boyfriend who had turned her into a werewolf. Maia attacks Kyle only to be stopped by Isabelle and Simon. The day after, they receive a message saying someone was holding Simon’s girlfriend hostage, and he should go to save her. Calling up Clary, Isabelle and Maia, Simon figures it’s a joke, only to find it was Maureen who had been kidnapped and killed when Simon didn’t show up to save her. In the church of Talto, Clary finds the book of the occult depicting the process of creating demon babies, while she’s observed by gray hooded figures. Clary wants to leave but finds herself battling a hydra demon. She manges to maim the hydra demon but is injured in the process with the demon burns. Isabelle come to rescue. Simon assist the Clave with Camille’s capture. Her subjugates are killed while she is escorted to the Instute where she is guarded until her interrogation. When Jace learns about Clary’s injuries he goes to her room. On the point of taking the next step in their relationship, Jace almost injures Clary with a knife. He finally breaks down and admits that he’s been having nightmares which was the reason he was avoiding Clary. Clary offers to help Jace by taking him to the Silent City. The Silent Brothers tell them that the nightmares Jace has been having are due to demonic influence which occurred after Jace was resurrected. The Brothers decide to perform the protecting ritual to give him the protection he lacks and Jace agrees to stay in one of the cells of the Silent City until the ritual can be performed. Clary wants to stay with Jace, but the Silent Brothers say that she will be a distraction. In his cell, Jace has a dream that he is back in Idris. Max appears to him and persuades him that the dreams are telling him he is actually hurting Clary. He cuts his arms after Max convinces him that will destroy the rotten part. With his blood, Max – whom is actually the demon Lilith in disguise – draws a rune on his chest which puts him under Lilith’s influence. Jocelyn and Luke attend their engagement party where Simon and Clary go missing. Clary is kidnapped by Jace but no one else knows about it yet. Jace has lied to Clary about leaving the Silent Brothers early and tells Clary about a rune that binds them to one another forever. Clary accepts and hands him her stele. He begins to draw a rune, but Clary finds out too late that this is not the rune he told her about which results in Jace taking her away. Simon is led away from the party by Maureen, now a vampire, and is taken to demon Lilith. She turned up at one of Simon’s band’s gigs and introduced herself as a promoter called Satrina. She needs Simon to resurrect Sebastian from the dead. When he tells her he cannot bring the dead back to life, she tells him that he has had that power since he became a Daylighter. In order to persuade him to resurrect Jonathan, she possesses Jace and orders him to kidnap Clary. Jace brings Clary to Lilith and she orders him to kill her if Simon does not resurrect Jonathan. Simon reluctantly bites Jonathan and drains some of his blood. He gets poisoned in the process due to Jonathan’s demon blood. Isabelle, Alec, Maia, and Jordan follow Simon using a business card they found in his wallet in order to find him. When they get to the building, they find the place that Lilith used as her nursery, with all the children dead. The babies were the outcome of Lilith trying to make half-demon children like Sebastian (Jonathan). They also find a woman – a mother, barely alive, who tells them what happened. Meanwhile, Clary tricks Jace in a hug and then grabs his knife and cuts the rune that Lilith is using to possess him on his chest, causing Jace to be freed from Lilith’s control. Jace tells Clary to run away but she stays and gets tortured by Lilith. The third time that Lilith goes to hit Clary, Simon kills Lilith by throwing himself in between Lilith and Clary. After the death of Lilith the Clave comes to the building. Jace and Clary share an intimate moment up on the roof: Clary tells him that she loves him no matter what happens. She then goes down to the lobby to meet her mother, Luke, Simon, Maia, Alec, Magnus and Isabelle, promising to come back. Meanwhile Jace is left alone. His rune heals, but now he’s hearing Sebastian’s voice in his head, and with Sebastian/Jonathan now in control of Jace, Jace is forced to finish the awakening ritual on Sebastian, who is now alive and whole again, and still evil. 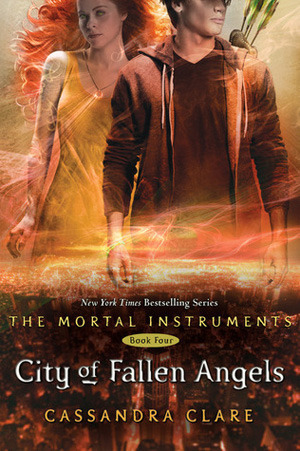 Shadowhunters – Men/Women that drank from the Mortal Cup consisting of Jonathan Shadowhunter and angel Raziel’s blood. Their children are Shadowhunters as well. Their job is to keep the downworlders in line. Downworlders – A term referring to creatures that are not human, such as faeries, warlocks, werewolves, vampires, demons, etc. Clave – These are the big wigs of the Shadowhunters. They make all the major decisions. Rune – Marks drawn on the skin of Shadowhunters to give them specific powers or protection. Iratze – A rune that heals Shadowhunters super fast. Stele – A tool that Shadowhunters use to create runes on the body. Witchlight rune-stone – basically a rock that gives off light.